Ola~ How are my dear merry-goers doing this lovely Sunday? 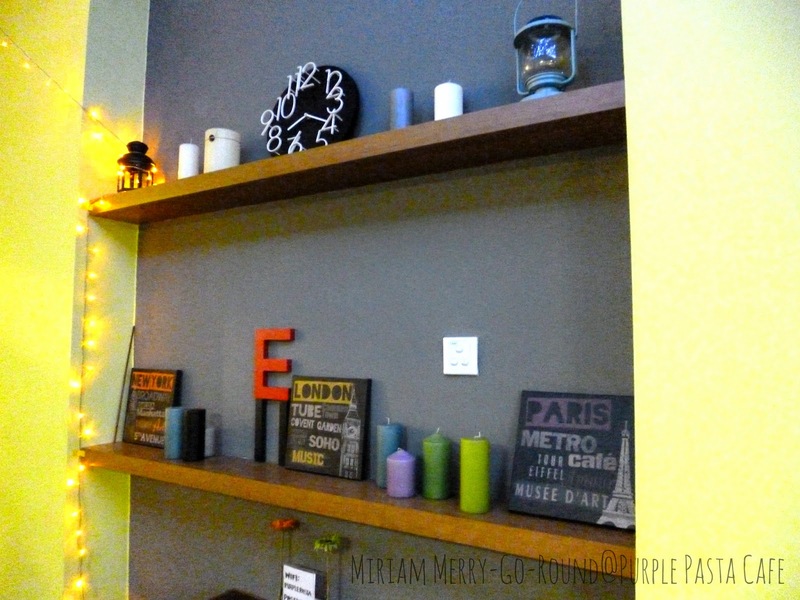 Today I'm back with another food review and to share with you a nice quaint cafe at Oasis Ara Damansara. Welcome to the Purple Pasta Cafe!! I was invited by dear Vera for their Rebel Dinner where we were served three new dishes that has not been officially added to their menu. The theme of the dinner was Unexpected, Surprise, Unusual and just downright Rebellious! 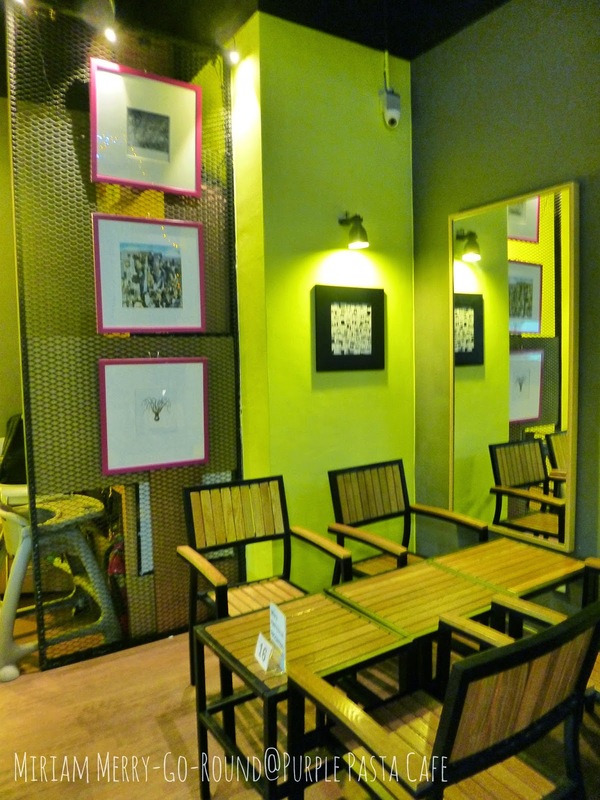 Firstly, there are three seating areas in Purple Pasta Cafe which is the outdoor area where you can dine al-fresco, the lounge area where you can enjoy a nice cup of coffee and of course the dining area. 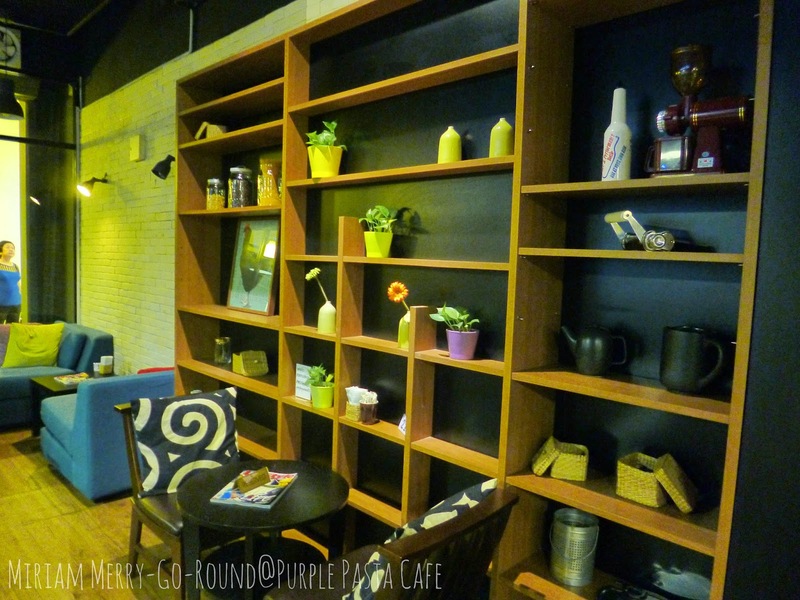 In terms of the decor, I think that slightly more effort is needed especially to suit their cafe name which is Purple. Their lighting needs to be improved as well although I get the whole idea of making the ambiance cozy and maybe romantic, it was a little too dark. Now let's move on to the dishes served that night. Firstly, we were served with an appetizer which is Mushroom and Seaweed Soup. The soup was really creamy and the texture was just nice with bits of mushroom chunks in it. However, I would say that the chef was a bit heavy-handed on the black pepper as it rather overpowered the dish. I am a huge fan of black pepper but I would prefer to be able to taste the sweet and salty tinge from the mushroom and the seaweed. The element of surprise in this dish was the popcorn! The second I bit into the popcorn, I was definitely surprised. 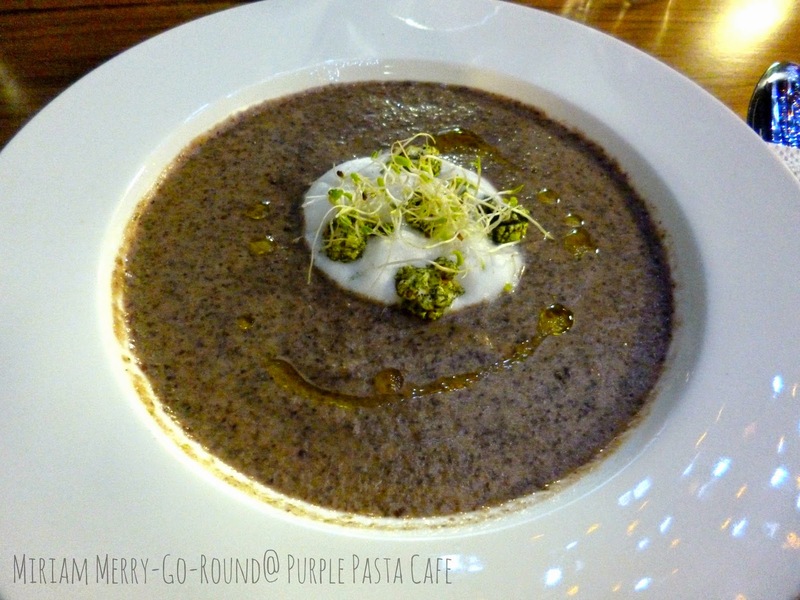 Normally, mushroom soup is served with toasty croutons to give that crunch in the soup but the chef at Purple Pasta Cafe gave it that twist by using Caramel Seaweed Popcorn! I love how the sweetness of the popcorn was not too overpowering and it really blends well with the soup. I give extra points for the creativity in this dish. Why 4 elements? As you can see, the Roasted Lamb was served with four different sauces which I could wait to dig in. I tried the sauces individually before pairing it with the lamb and oh-boy was I in for a surprise. The four sauces served were Chocolate, Grape, Mint and Tangy Mayo. Yes! You read it right. I was served with Chocolate sauce! From the colour, you would assume it to be the regular black pepper or mushroom sauce but when I first tasted it, I was surprised to find it to be dark chocolate sauce. Now it was time to pair it with the Roasted Lamb. *drumrolls* I nearly died and went to heaven! I love how succulent the lamb was.. it was so tender and juicy! The cut was cooked to my liking, not to raw and not too dried. The chef told us that the lamb was not marinated at all which means he really did a great job in roasting the lamb patiently to lock in all that moisture. The bed of mashed potatoes were awesome as well. 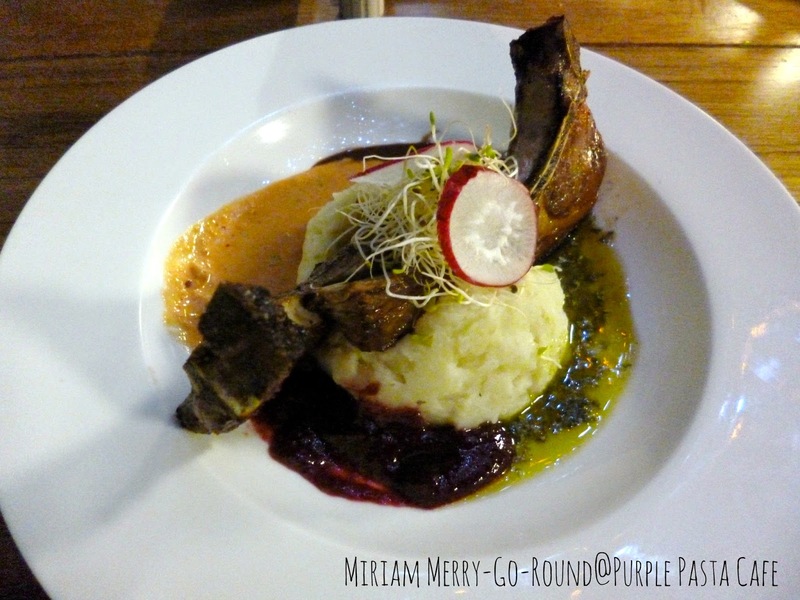 Creamy and slightly seasoned, the mashed potatoes really complimented the lamb. However, plating wise I wouldn't really recommend putting it in the centre of the plate as it was rather messy to cut the lamb with the mashed potato. I actually quite like this dish as it certainly gave me the element of surprise and the sauces actually compliment the dish really well. The Tangy Mayo was a great sauce to pair with the lamb and the Grape sauce gave a berry kick when paired with the mashed potato. I liked the Chocolate sauce but I would suggest using a lower cacao percentage chocolate so that it was not too dark when paired with the lamb. There was a slight bitter aftertaste when paired with the lamb. A slightly sweeter chocolate should do the trick. Meanwhile the Mint sauce did not stand out in the dish and was quite mediocre. After that fulfilling main course, it was time for dessert. Now, would there also be another element of surprise in the dessert? 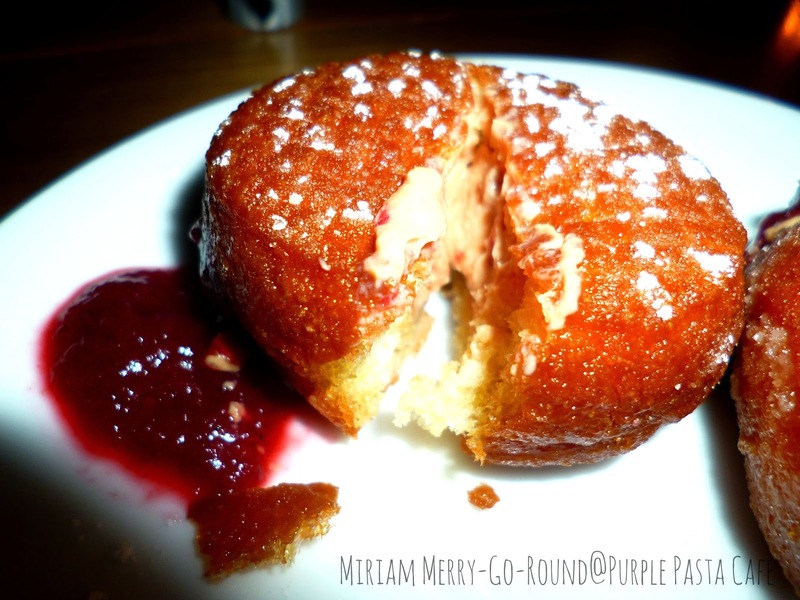 The dessert served was Donut Foie Gras with Grape Jam. Surprised yet? Even the name makes you wonder would this taste good. In case you didn't know, Foie Gras is actually the liver of a duck that has been specially fattened. I actually do not condone such a cruel act and I don't know where the chef found foie gras, but this ingredient is actually quite a high end ingredient. It is also a salty ingredient which made me really curious how it would taste like when paired with grape jam. The donut pastry was filled quite well with the foie gras and it tasted quite good. The sweetness of the grape jam actually really complements the saltiness of the foie gras. 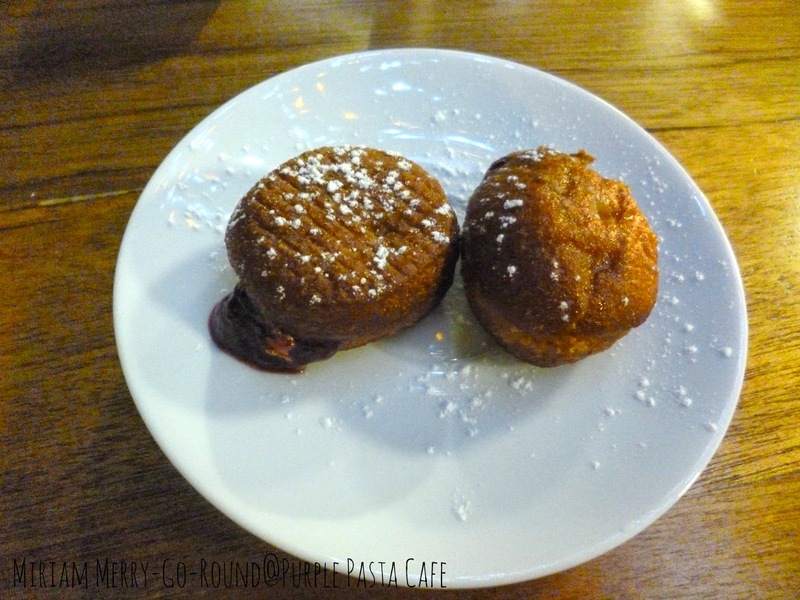 However, the donut pastry was slightly too tough for my liking and because it has been deep fried, it didn't really settle well in my tummy after a heavy main course. I would recommend a more refreshing dessert but I do compliment the chef for thinking of such a creative dish. 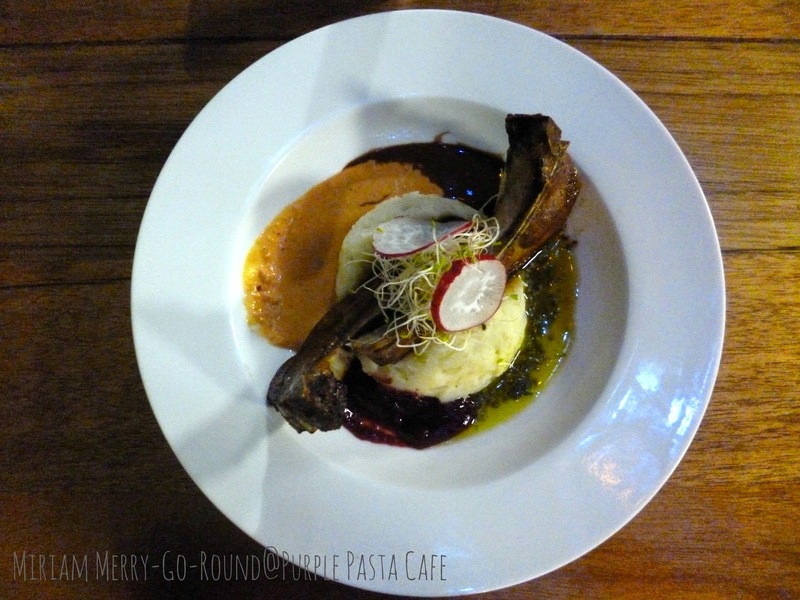 The Purple Pasta Cafe is actually having a RM 5 Pasta Promotion daily! You can try out their pasta at just RM 5 and if you like it you can just order the full-sized version. Don't think that the portion for RM 5 is small because Purple Pasta Cafe is rather generous with their servings! 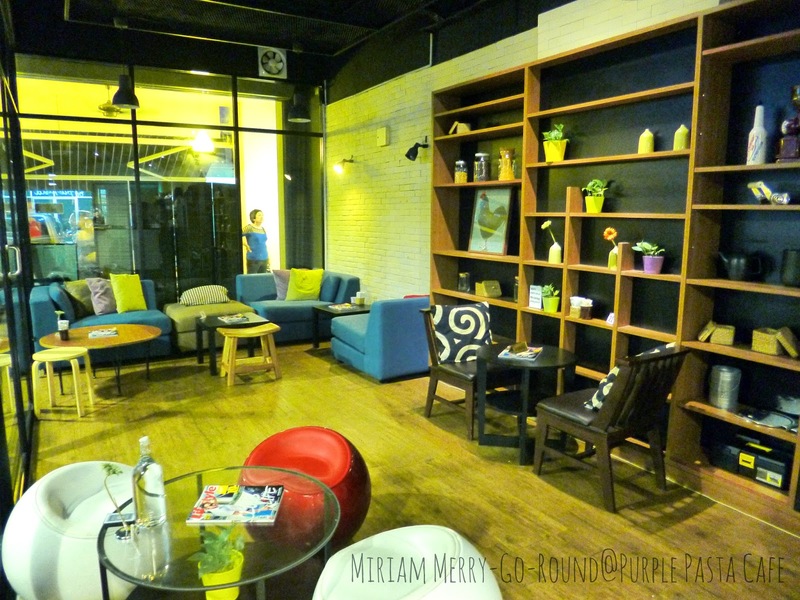 If I've piped your interest, do check out this lovely cafe for your next meal! Once again, thank you to Vera and Judy from Purple Pasta Cafe for inviting me for such a scrumptious dinner. Yeah... I loved the lamb too!